As the Golden Giant Mine has matured, ore has increasingly come from remnant pillars and deep, narrow vein lenses. In the narrow vein area of Upper Block 5, located under the sandfilled stopes of the David Bell Mine, a shear zone developed at the ore – hangingwall contact. When traditional cable bolt and shotcrete ground support were found to be insufficient to support the failing rock mass, shotcrete pillars were proposed. The design methodology and installation techniques for the shotcrete pillars are presented. In addition, the results from the instrumentation program, consisting of Contractometers within the pillars and MPBX’s and SMART cable bolts in the back, are discussed. The Golden Giant Mine is located at Hemlo, Ontario, 40 km east of the town of Marathon on the north shore of Lake Superior. This operation is wholly owned and operated by Newmont Canada Limited, and has been producing gold bullion since 1985. The Golden Giant Mine is bounded by the Williams Mine to the west, and by the David Bell Mine to the east. The Golden Giant claim block also extends below the bottom of the David Bell claim block. As the mine has matured, mining production has increasingly come from remnant pillars and deep narrow vein lenses. For the narrow vein mining, there is greater reliance on longitudinal retreat mining, where sills are subjected to high mine induced stresses for longer periods of time. This case study focuses on the role of instrumentation in rock mechanics assessment for the design, construction, and monitoring of shotcrete pillars in one of the narrow vein areas. 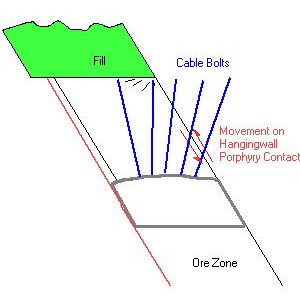 The Upper Block 5 Zone extends from 4235 mine elevation (1000 m below surface) to the 4110 level (Fig. 1). It is bounded above by sandfill from Teck Operating Corporation’s David Bell Mine, but is otherwise isolated from other mining. shown by the green circle. The block has been divided into two mining fronts, the Eastern and Central stopes, which are separated by a block of waste. Mining of this zone is performed using longitudinal retreat from sublevels on a 10 to 15 m interval. The Eastern stopes were mined from June 1998 to October 1999, and the Central mining front stopes were mined immediately following mining of the Eastern stopes. In March 1999, a shear developed parallel to and along the hangingwall of the 4225 and 4217 levels, resulting in significant ground deterioration. This shear zone, which was parallel in orientation to the orebody, caused rapid convergence of the sill back along the south wall of the zone. In the far east end of the 4225 sill, convergence on the order of 2.5 cm was measured. 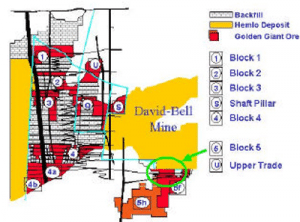 Failure was attributed to the stress caused by the close proximity of the David Bell sandfilled stopes and the ongoing mining in the Eastern stopes, combined with the contrasting geology between the ore and hangingwall. While the hangingwall is comprised of a competent granite porphyry, the ore is a highly altered serecitic schist. Due to the stress conditions, a series of wedges formed in the sill back. These wedges would slide along the porphyry, appearing as a shear in the sill back (Fig. 2). Figure 3. Monitoring data from SMART cable through hangingwall shear. 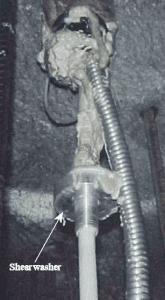 Due to the convergence rates experienced and damage to the shotcrete, the support pattern was augmented with a second pass of cable bolts in July 1999. New instrumentation was also installed as part of this support pattern. The new support failed to fully arrest the convergence; however, the support supplied was adequate to complete stoping on the Eastern front. Mining of the Central stopes began in December 1999. While damage was difficult to assess visually during this time, the installed instrumentation clearly showed the deteriorating support capacity (Fig. 3). During the period between December 16, 1999 and January 7, 2000, convergence in the sill backs became exponential, with rates approaching 1.5 mm per day. It was apparent that the installed support was approaching yield. 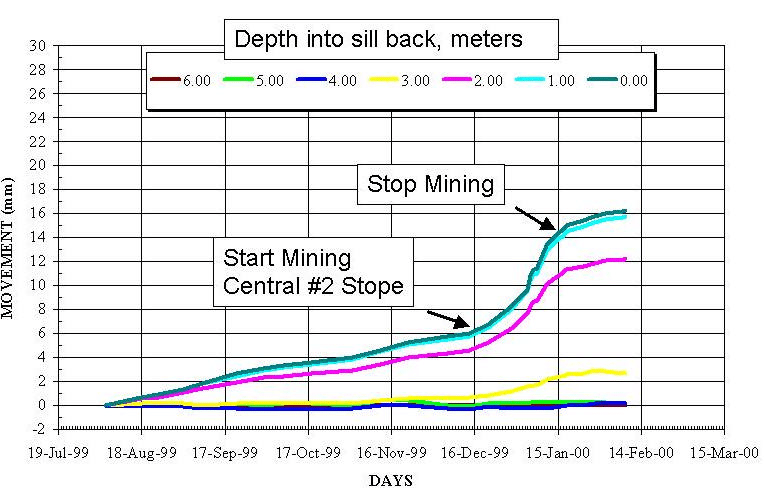 Mining in Block 5 was halted on January 7, 2000, while support options were evaluated. Based on the results of the analyses, it was decided to install a series of reinforced shotcrete pillars. It was apparent from the convergence rates from the SMART cables (Fig. 3) that the cable pattern could slow but not fully arrest the movement of the wedge that had developed, so the safety factor for the cable support was assumed to be close to 1. For the shotcrete pillar design, a safety factor of approximately 1.5 was considered desirable. The peak load assumed for the pillar array was therefore calculated to be 18,000 tonnes. Space restrictions required that the pillar design diameter be no more than 0.9 m (3 feet). The pillars were to be constructed of shotcrete and rebar. Using the 24-hour compressive strength of shotcrete (i.e. 15 MPa), it was anticipated that a pillar of this diameter would be able to carry a load of 1,200 tonnes. To support the 18,000 tonne support capacity, 15 pillars would be required. These pillars were to be placed at 8 m spacing along the length of the 120 m sill. The proposed placement for the pillars is shown in Figure 4. Note that while the design safety factor of 1.5 was based on the 24-hour compressive strength of the shotcrete, the strength of the shotcrete was expected to increase after the initial 24-hour period to an ultimate compressive strength of approximately 30 MPa. Consequently, the actual factor of safety for the proposed shotcrete pillar design was closer to 2.5. The shotcrete pillars were constructed by forming a square cage of rebar anchored in boreholes in both the floor and the back (Fig. 5). Each rebar was 4 m long, with 1m protruding from the hole. Additional rebar was tie-wrapped to this rebar to complete the cage. Sono tubes were originally used as forms, but these were found to bulge too easily. A better solution was to use steel half-culverts to form the pillars, with angle iron tack welded to the edges so the halfculverts could be bolted together. These were cut to length and bolted together, with 0.5 m by 0.5 m hole left in one side. showing rebar cage and contractometer. Initially, shotcrete was sprayed into the gap in the pillar form. However, the pillar integrity for these sprayed pillars was low due to the porosity caused by rebound of the shotcrete within the pillar. To overcome this problem, shotcrete was poured into the gap, and the form was vibrated to remove any air voids before the shotcrete cured. In some cases, it was possible to recover the forms from the pillars once the shotcrete had cured. Shotcrete was then sprayed around the top and base of the pillar to enhance the bond between the pillar and the floor and back. A completed shotcrete pillar is shown in Figure 6. Figure 6. Completed shotcrete pillar. Following pillar installation, the integrity of the shotcrete was tested using a Hilti drill. Poorly constructed pillars were indicated by the high number of voids encountered during the drilling. Pillars were constructed one at a time. To monitor ground conditions, a convergence meter, consisting of a micrometer on a stick, was used. Readings were taken every hour, and the crew was instructed to evacuate the construction site if the movement rate exceeded 0.7mm/24 ho urs during the 1-hour reading period. Fortunately, this rate was never exceeded during the construction period. true deformation of the pillar was also required. The strain on the pillars was determined using Mine Design Technologies SMART Contractometers, an instrument much like a multipoint extensometer, but acting in reverse. These devices use a collapsible structure to facilitate the measurement of convergence. The instruments are flexible 6-point fully recessable units with integrated electronic readout heads. Each Contractometer had anchor points at 0.06, 1.2, 1.9, 2.7, 3.4 and 4.0 m from the instrument head. To install each instrument, a 2-inch diameter hole was drilled in the floor and the back at the center of the shotcrete pillar location. The instrument head and first anchor were recessed in the back and secured in place using an expanding foam adhesive; the 4.0 m anchor was installed in the hole in the floor and grouted in place with type 10 normal Portland cement. The instrument was centred within the shotcrete pillar. Installation of the Contractometers is shown in Figures 7 and 8. Shear washers were used on each anchor to ensure that the displacement of the shotcrete pillars was transferred to the instrument. Due to the amount of movement expected, 190.5 mm (7.5 in.) potentiometers were installed in these instruments, providing 95.3 mm (3.75 in.) of extension or contraction within the instrument. Contractometers were installed in every fourth pillar in the pillar array – two in the 4217 sill, and two in the 4225 sill. prior to forming and shotcrete placement. shotcreted portion of the pillar. Monitoring of all instrumentation (Contractometers, SMART cables and MPBX’s) was carried out during the extraction of the sills. In addition, regular visual inspections of the shotcrete pillars were conducted. Cracks in the pillars were painted and dated to identify the movement in the pillars on a shift-by-shift basis (Fig. 9). during mining. Failed areas marked with red paint. Typically, the pillars began to show damage when the blasting front was within 2 rings (2.5 m). Extraction of the pillars was typically done with the longhole blast to ensure they could easily be extracted from the drawpoint with a 2- yard scoop. Where width restrictions were an issue, the pillars were sometimes blasted before the drill was setup, in order to create enough space for the drill. Data from the four Contractometers is shown in Figures 10 to 13. Contractometers C0100-03 and C0100-02 were installed in the 4217 sill, and C0100-04 and C0100-06 were installed in the 4225 sill. In all cases, the baseline instrument readings were selected after the shotcrete had set, and the pillar had undergone initial loading. This served to simplify the interpretation of the Contractometer data. Results from the individual Contractometers are discussed below. Figure 10. Data plots for Contractometer C01006 showing a.) movement vs. date, and b.) movement vs. distance. Figure 11. Data plots for Contractometer C01004 showing a.) movement vs. date, and b.) movement vs. istance. Figure 12. Data plots for Contractometer C01003 showing a.) movement vs. date, and b.) movement vs. distance. Figure 13. Data plots for Contractometer C01002 showing a.) movement vs. date, and b.) movement vs. The displacement versus time plot for this instrument is shown in Figure 10a, where it can be seen that the upper 2 m of the shotcrete pillar are beginning to compress. The displacement versus distance plot (Fig. 10b), which shows the amount of closure at each anchor location, shows the same trend. The ground around this pillar was mined early in the sequence for the 4225 sill, so little data is available. Only about 2mm of compression was observed prior to destruction of the pillar. The displacement versus time plot for this instrument (Fig. 11a) shows increasing compression of the pillar with time. The compression begins to accelerate after August 11. The instrument shows some buckling of the pillar at about 1.9 m from the instrument head. However, failure of the pillar begins to occur between August 18 and August 23. As the pillars crush, pieces begin to spall off. When the spalling reaches the location of the Contractometer, the movement changes from compressive (crushing) to extension (tension) as the block containing the anchor moves away from the core of the pillar due to buckling. This can be observed in the lower portions of the pillar (between 2.7 and 4.0 m). From the displacement versus length plot (Fig. 11b), significant compression of the pillar can be seen between July 25th and August 18th, with most of the compression occurring within the upper 2 m of the pillar. After August 18, failure of the lower portion of the pillar occurs; however, this failure occurs at the anchors below 1.9 m (2.7 and 3.4 m). Steady closure of this pillar is observed on the basis of the displacement versus time plot (Fig, 12a) for this instrument. The displacement versus length plot (Fig. 12b) shows an increase in the compression of the pillar, with movements occurring uniformly throughout the pillar. The rate of compression begins to increase after April 12; however, the pillar does not undergo failure prior to being removed. The total amount of compression in this pillar is on the order of 7 mm. 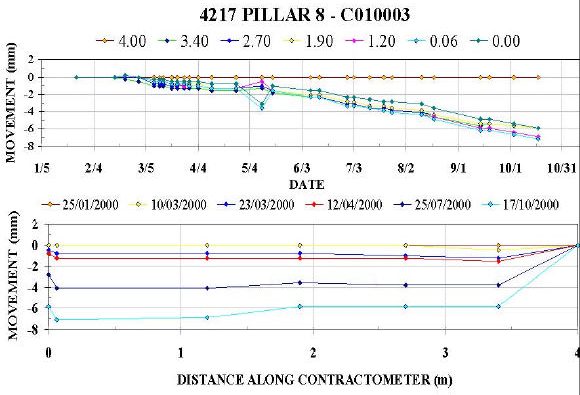 The displacement versus time plot for this instrument, shown in Figure 13a, suggests that the pillar is stable, assuming little or no load prior to August 11. On this date, the pillar experiences some compression, focused mainly between about 1.0 m and 2.7 m (the midpoint of the pillar). After the August 11 reading was taken, the pillar appears to undergo some bulging at its midpoint. These trends are echoed by the displacement versus length plots (Fig. 13b), which show a maximum movement of 4mm tension at the midpoint of the pillar. 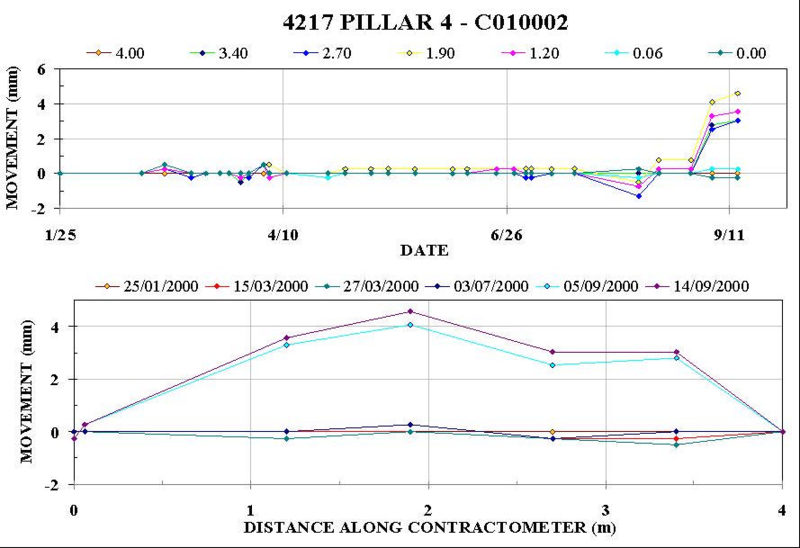 The movements shown by this Contractometer suggest that the instrument was dislodged during the shotcrete spraying process, and ended up located very close to the wall of the shotcrete pillar. Consequently, the instrument would reflect any bowing of the pillar sides experienced during loading, manifested as tensile readings while the overall pillar movement was compressive. The movements also indicate that the foam adhesive used to anchor the instrument in the back of the excavation was ineffective, and that the head had moved during construction. In some cases, movement of the instrument head and anchor 6 was observed, suggesting the foam adhesive used to secure the instrument in place in the stope back was ineffective. In future, it will be necessary to ensure that the instrument head and anchor 6 are firmly grouted in place prior to spraying of the shotcrete. Pillar loading is characterized by compressive movement of the instrument; rupture of the pillar, or pillar failure, is characterized by tensile movements within the instrument as the pillar bulges and sloughs apart. 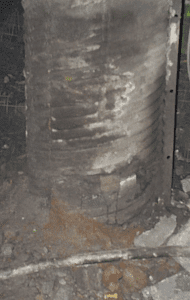 Pillar failure appears to occur at about 1% strain, which, for 3 m pillars, corresponds to about 30 mm of movement. Movements in the Contractometers installed within the pillars coincided with the movements in the MPBX’s and SMART cables located in the stope back. 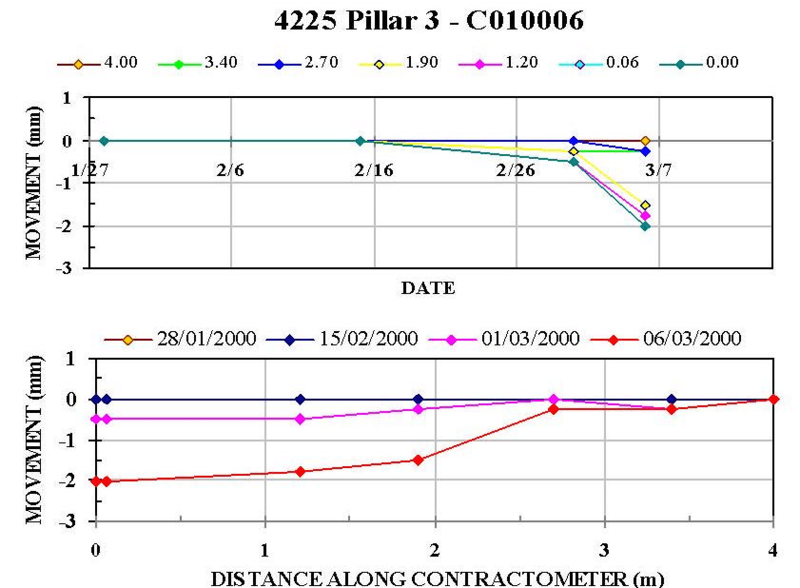 Movements in the Contractometers also matched the visual damage assessments performed on the shotcrete pillars. Contractometers acted as a set of eyes into the pillars, allowing assessment of the depth of damage. Contractometers measure closure of both the floor and back, whereas MPBX’s and other instrumentation only measure the movement in the back. Initially, the operators relied more heavily on the information from the MPBX’s. However, as they gained confidence, they came to rely on the information obtained from the Contractometers. The data from the Contractometers was used to interpret visual damage of the pillars to assess worker safety. Based on the observations made, the monitoring of shotcrete pillars with Contractometers was a success. Because the instrument head is located in the stope back, it is able to measure movement within the pillar without being affected by the crushing of the pillar. In addition, the use of the shear washers on the anchor nodes within the pillar ensured that the movement of the pillar was transferred to the anchor nodes, and that the pillar material did not become debonded from the anchor locations. The Contractometer also allowed measurement at six discrete locations: one in the floor, one in the back, and four within the pillar itself. This ensures that the movement profile of the entire pillar, as well as the floor and the back, are all measured. 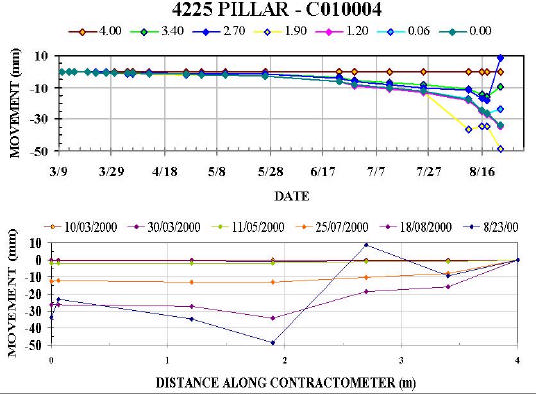 From all evidence, the Contractometer appears to be a viable instrument for the monitoring of shotcrete pillars. 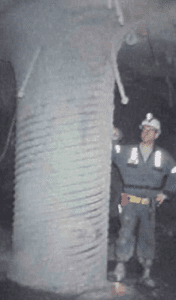 Based on the trials conducted at the Golden Giant Mine, the operators were able to refine the construction of shotcrete pillars and identify the techniques that worked most successfully at this mine site. 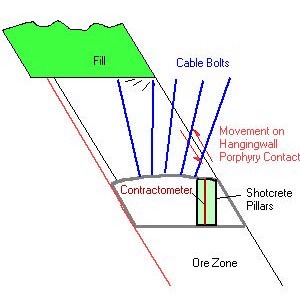 In addition, through the use of Contractometers, the operators were able to verify that the design principles used in the sizing and placement of the shotcrete pillars were valid. The operators were also able to establish a criterion for pillar failure, which occurred at 1% strain. The use of Contractometers allowed them to see what was going on inside the shotcrete pillars, and to get a feel for how close they were to failure of the pillars. From the results of the current program, the shotcrete pillar and the Contractometer will become part of the ground control toolbox, where applicable. The authors would like to express their gratitude to Newmont Canada Limited for their permission to publish this paper. We would also like to thank the personnel at the Golden Giant Mine for their assistance in the preparation of this paper.